I’m not sure how your summer is going but mine is zooming by. I have tons of funny moments to share for a Goofy Monday edition but by the time I look at the calendar and think about it, it’s usually Tuesday or Wednesday already. So I’m trying my best to at least write this WWW Wednesdays on time, especially since we continue to read lots of good books. Made To Stick: Why Some Ideas Survive and Others Die by Chip Heath & Dan Heath. – Hoot by Carl Hiaasen. After enjoying Chomp a few months ago, I thought I’d go back and read Hiaasen’s first young adult novel Hoot to see where it all started from. I wasn’t disappointed. Hiaasen has a very natural and convincing way to make his own characters become more aware of the environment around them and show how their actions can have a positive or negative effect. He doesn’t preach to preserve the environment one way or the other, but rather guides you in understanding how we can all help, one person at a time. The main story involves young Roy Eberhardt, who is new to Florida and doesn’t think it’s as cool as Montana. He may just change his mind by the end of the book. There’s bullying, new friendships, greed, and a whole lot of natural props (snakes and alligators, anyone?). A fun read for the summer, or anytime of the year. – Random Acts of Kindness by the editors of Conari Press. A little gem of a book sharing true stories of people’s encounters with random acts of kindness (they were either the givers or the recipients), as well as inspiring quotes about kindness and giving. This short book is super fast to read but full of ideas of what makes a random act of kindness kind and special indeed. How to Remodel a Man by W. Bruce Cameron, the author of A Dog’s Purpose and A Dog’s Journey, a couple of my favorite books these past couple of years, and Eight Simple Rules for Dating My Teenage Daughter. This book looks absolutely hilarious and I can’t wait to laugh my way through it. – If You Want To See a Whale by Julie Fogliano. This book advises you what to do (and what not to do) so you can spot a whale. That includes wrapping yourself up in a not-too-cozy blanket so you don’t fall asleep, and being very, very patient. – How To Clean Your Room In 10 Easy Steps by Jennifer LaRue Huget. This hilarious book shows you the best way to tidy your bedroom, starting with waiting for your mom to holler, “GET UP THERE AND CLEAN YOUR ROOM—NOW!”, using all three of your names. One of the next steps is to actually take everything out of the drawers and closets… My kids laugh out loud at the advice and I haven’t seen them follow it, fortunately! – My Mom Has X-Ray Vision by Angela McAllister. Matthew believes his mother has x-ray vision because she always knows what he’s doing. It beats the eyes behind the back of the head, doesn’t it? One day he decides to test his theory. The results are quite astonishing, especially for the reader, who gets to see a lot more about super mom than Matthew himself! – The Museum by Susan Verde. As a young girl walks through various museum galleries, she experiences different emotions by looking at different styles of art. When she finds herself in front of an empty canvas, she feels inspired to create art in her own way. The story is OK but Peter H. Reynolds’ illustrations are what make this book a must-read. Well, somehow it’s been three weeks since my last WWW Wednesdays update. It’s not for lack of reading because we’ve done a lot of that. Rather, a limited number of hours available in front of the computer with internet access, and a lot of quality time with the kids. Including some great reading I’m sharing below. Hoot by Carl Hiaasen. I read Chomp a few months ago and I really enjoyed it so I thought I’d go back to Carl Hiassen’s first young adult novel and see where it started from. So far, so good! The Night Circus by Erin Morgenstern. This is a magical story in every sense of the word. I truly enjoyed following Celia and Marco’s journey and their struggle to go against their preset fate. Two things bothered me about this book though. It was a little too long and could have used some editing, as some chapters went on for too long. And the story bounced not only from one place to the next, but from one moment in time to another, back and forth. I tried to keep up with the time shifts but it eventually tired me. Other than that, it’s definitely a story worth reading. Mennonite In A Little Black Dress by Rhoda Janzen. Although the premise of this memoir is interesting – a 40-something year old woman going back to her Mennonite family after her husband leaves her for another man and she recovers from a serious car accident – it couldn’t keep my interest. The first chapter tries to stay on track but after that the book goes all over the place, bouncing from one current event to another, then to a memory, then to another. As I was reading this book, I couldn’t keep track of what year each memory was taking place and it got tiresome. I put it down halfway when my interest ran out. If you’re interested in reading about Mennonites in the modern world, it’s probably a good read, as long as you’re aware of the story bouncing around with no specific purpose. Night Sins by Tami Hoag. I actually own this book and started it a couple of weeks ago but I’m not finding myself in the mood to read a story about a kidnapped kid in the middle of winter in the Minnesota at this time. Besides, I just got several books from the library I really want to read, so I put this one back on my bookshelf for a later time. 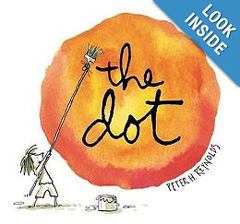 The Dot by Peter H. Reynolds. We LOVE this book! Vashti is a young student who believes she can’t draw, so her art teacher simply asks her to draw a dot, and then sign her artwork. What happens next makes Vashti change her mind about her artistic abilities. This is a great book for any kid who doubts his/her own talent. – Ish, another book by Peter H. Reynolds. Ramon loves to draw but loses confidence after his older brother notices his artwork isn’t perfectly true to reality. Fortunately his sister gives him a new perspective on things and encourages him to find his own style. A wonderful story on creativity, individuality and what art is about. – Oh, The Places You’ll Go! by Dr Seuss. What better book to read before heading to kindergarten? Or second grade? Or a new path in life? We all had our own reasons to read this book and we enjoyed it very much. I’m looking forward to reading it again when we reach a new milestone. – E-mergency by Tom Lichtenheld and Ezra Fields-Meyer. The letter E falls down the stairs and gets hurt. It’s an E-mergency! Now the story can’t use the letter E until it heals, so which letter will replace it in the meantime? This is a very funny story that features with even funnier illustrations that tell a whole story by themselves. You could probably spend a whole hour going through this book and not notice everything there’s to see. – Coma by Robin Cook. I like it so far. The writing style is not perfect but it doesn’t interrupt the flow of the story. I keep thinking I may have read this book a very long time ago, and just don’t remember it. – Still Life With Crows by Douglas Preston and Lincoln Child. This is the first time I’ve read a book by either Douglas Preston or Lincoln Child and this was my first encounter with FBI Agent Pendergast (I loved the unique character!). I really enjoyed reading this book, and since I’m not a Preston & Child expert, I don’t have other P&C books to compare it to and judge if it’s better or worse. Compared to similar nail-biting thrillers, this one makes it to the top of my list. The chilling, gruesome and scary suspense throughout the book kept me on the edge. I think my heart skipped a beat or two several times and I don’t have any nails left to bite. If you’re looking for a good thriller that will keep you up at night, this is it. I can’t wait to read more by Preston & Child. – Chomp by Carl Hiaasen, a young adult novel. My best friend recommended this book to me and told me I would like Hiaasen’s stories. I’m giving this one a try and if I like it, I’ll read more of his books down the road, probably starting with Hoot. – Over and Under the Snow by Kate Messner. Over the snow, the world is white and quiet, but under the snow lays a secret world of squirrels and hares, bears and bullfrogs, and many other critters who live hidden or underground in the woods during the winter. This is a great book for kids who want to understand better how nature works. The illustrations are very pretty too. – Little Penguin’s Tale by Audrey Wood. Grand Nanny Penguin tells a group of little penguins the story of a little one who is searching for fun in this ice cold world. As she tells her story, you can see Little Penguin doing exactly what she describes: he slides down the hills, dances with the gooney birds, and mingles with dozens of other animals at the Walrus Polar Club, until… he gets eaten by a whale! But the other little penguins don’t like how Grand Nanny Penguin’s story ends so she decides to edit it. This is another hilarious story by brilliant children’s book author Audrey Wood. – Judy Moody and Stink: The Holly Joliday and Judy Moody and Stink: The Mad, Mad, Mad, Mad Treasure Hunt by Megan McDonald. McDonald has also written the Judy Moody books and the Stink books. My six-year old has read a few books featuring each character so far and really likes them. Somehow when you combine these two siblings together, it seems to create some very funny stories. How would I know, without having read any of these books? Because I sit next to my son when he’s reading them and I hear a lot of giggles and laughs as he turns the pages. Sometimes he even asks me to read a page so I can laugh too. He quickly takes the book back when I’m done though. To me, that is what reading is all about.